If there’s one thing we know works for marketing businesses here on the Long Beach Island, it’s vehicle wraps. On a branding cost analysis and return on investment (ROI) basis, fleet wrapping is simply the most efficient way to market your business on LBI and Ocean County. Mobile signage, vehicle wrap, fleet branding… whatever you want to call it, it’s one of the most effective ways to market your Long Beach Island business. It’s a unique medium with proven results. When it comes to van, car, truck, and trailer wraps, Typestries, based on the mainland adjacent to Long Beach Island, is the cutting edge in fleet graphics and vehicle wrapping. Right here on LBI, Johann Tile saw this first hand. 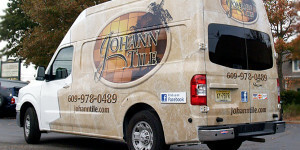 The day after Typestries did the Nissan Van wrap for this Manahawkin/Long Beach Island-based company, they landed a walk up $7,500 tile job. They came right back and had their other truck wrapped. “Both vehicles continue to produce profitable leads. Drive past a job site and their brand shines in a sea of blank white vans,” says Long Beach Island resident and owner of Typestries, Rick McDonough. Let’s also remember that vehicles that service LBI are much more susceptible to rust. The same salt air that brings people to and Long Beach Island by the thousands is a killer to your vehicle. When you invest in a vehicle wrap, you’re investing in the body of your car or truck. Wraps not only protect your vehicle’s finish for resale value, but they also decelerate the rust process. There are other ways to get that kind of name recognition, and some of them are very important to your brand. Take a billboard on the bridge to Long Beach Island. The same people who see your vehicle will see your billboard, but how much is that billboard per year? It’s a lot more than the cost of your trailer wrap, which you could have for a decade. Or compare the cost of a box truck wrap to a radio, newspaper, or local cable ad on Long Beach Island. Chances are, you’re dollar goes a lot further with a good vehicle wrap. Typestries Sign & Design in Manahawkin has been serving Ocean County as well as all of New Jersey, Pennsylvania, and New York for 20 years. We were among the first in the Long Beach Island area to do vehicle wraps and offer 3M, Controltac, Oracal, Arlon and Avery wraps. The successes of the businesses that have invested in van, truck, trailer, car, or entire fleet wraps speak for themselves. Contact us today and we talk about wrapping your vehicle right off LBI.